Man you are awesome…. First one i have seen homemade and looks beautiful….. So amazingly unique and creative…yet same song I hear in 90% of YouTube videos….makes you say….why? Hey can I share this on my willyawesomefitness page on facebook? This is a cool idea. You'll be a brick shithouse in no time. Minus a brick. Its actualy better then most gym machines. If theres 10 kg on there then your actualy lifting 10 kg. 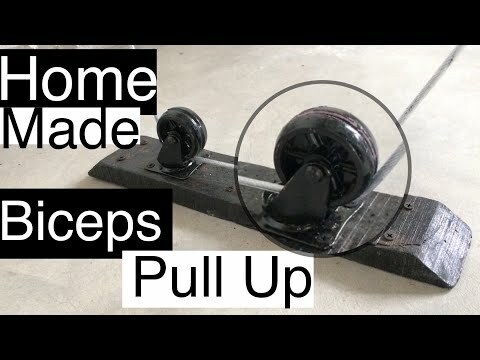 Most gym machine use roll systems so when you pull the cable 9 cm the weight moves 3cm. So 90 kg all of a sudden feel like 30. What is the load this can take? Pulleys look delicate. .will collapse for heavy weight. Buy a screwdriver bit for your drill. इस रसी को क्या कहते हे,,? ऑर ऐ कहा मील सक्ती हे,,?